Let’s face it, we’re in the digital age. Electronics are everywhere! Whether that is good or bad depends on how you use these awesome little gadgets. According to the Sandvine report, “The average household now has over seven active devices in use each day, with 6% of households having more than 15 active devices”. Crazy, right? Most of these devices are also connected to a mobile network or Wi-Fi. Good thing we can’t see all those waves flying around us, that’d be pretty darn scary! A lot of us are to some degree addicted to that incredible device we have in our pockets. It is for many people, the first thing they look at in the morning and the last thing they look at at night. It is an integrated part of your life. We don’t always have the chance of learning through total immersion. But we can easily create an artificial immersion by making a few simple changes around us. Why not change the default language of your phone? It’s a very simple change that can go a long way. Your favorite pocket companion is a polyglot, use that to your advantage! After changing the language on your phone, you can also change the language of all the apps you use frequently. Sure, in the beginning it will be hard to find your way around, but you will quickly learn many new words seamlessly. In fact, you can change the language of anything you use often. If you’re a gamer, change the language on all your gaming consoles. The many hours you spend playing will seamlessly help you learn languages. You’ll quickly learn new words that are used frequently in each game. The entire storyline of many games is often translated in many languages. Sure, you may sometimes have to look up a few words in the dictionary, but learning a language while playing Call of Duty or Skyrim may definitely be worth it. You can do the same thing on all your social media. Change the language of your Facebook, Twitter, and YouTube account. You can learn a lot by simply changing the language of social media. For example, if you really want to make Facebook an effective learning tool, you can use the news feed to your advantage. You know when you mindlessly scroll through the news feed when you have nothing to do? You see a bunch of cute cat videos, the latest triple bacon recipe (yum) or an intriguing article about Linda, the two-headed sheep. Why not use your news feed to learn languages? You can simply like any page you find interesting in your target language. The pages you follow don’t need to be specifically about language learning. Any topic will get you informed on the subject and will help you learn the language at the same time. You probably already liked many pages about cars, movies, recipes or whatever else in English. If possible, change all those pages in your new language. In upcoming posts, we will also talk about how you can find and add friends from other countries. You will then see all their posts and the things they liked and commented on. It will all appear in your news feed. When you read your friends’ comments, you will see many expressions and learn the way native speakers type. It may not always be grammatically correct or error-free, but it’s very real. If you’re the type of person who spends a lot of time on electronics and social media, making these simple changes can have a huge impact on your language-learning skills and your motivation to learn. It’s only matter of adding content that you enjoy. This is just one of many ways to adapt your existing routine to include language learning. If you enjoyed this post, feel free to share it with your friends by using one the social links below. 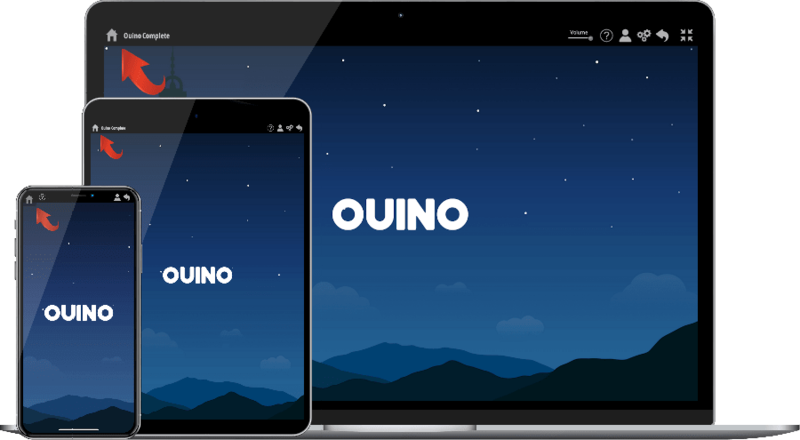 If you are looking for a great language-learning method that you can use on all sorts of devices, check out our website at Ouino.com. Thanks a lot! Until next time! Very helpful! Cool video! Thank you. What an excellent post on language learning with the help of devices and social media! It’s a wonderful way to immerse oneself into the language without putting too much effort. Such a method is something that everyone could do and will definitely make a benefit of it. Also, a great idea with subscribing to pages in the target language on social media. This will allow learners to be constantly in the process of receiving information in the language they’re mastering.